In 2004, the Boston Archdiocese announced plans to close 65-80 of its 357 parishes. The same year, the Detroit Archdiocese revealed it would close 65 of its churches by 2015. Citing plans for redevelopment New York City’s Archdiocese has closed several iconic churches in Manhattan, including Harlem’s 105-year-old St. Thomas the Apostle, Church – closed since 2003 and sold to developers this year. Similar headlines appear in newspapers from every state. Dwindling congregations and economic hardships are forcing historic churches all across the country to close their doors. In 2005, the National Trust for Historic Preservation named all of the historic Catholic Churches in the Greater Boston area to its ‘11 Most Endangered’ list, highlighting the significance of the problem: we are faced with a wealth of architecturally and historically significant churches that have been or will be abandoned. In the late 1950s, 74 percent of American Catholics attended church on Sundays. By 2007, that number was closer to 33 percent. Over the forty years between1965-2005, the United Methodist Church saw a 27 percent reduction in membership. Over the same time period, the Episcopalian Church and the Presbyterian Church saw 35 percent and 46 percent declines, respectively. These shrinking congregations have limited financial resources, and, often, large historic properties that require costly on-going maintenance, leaving the congregation with no good choices. Many congregations feel forced to make the hard choice to close their buildings. Abandoned churches are often placed on the market, but it can be a challenge to attract buyers, who have the same question as members of the surrounding communities: what should be done with these buildings? Vacant churches are a neighborhood hazard, attracting the worst kinds of congregations. They are prone to squatting, dangerous deterioration, fire, and have a chilling effect on community morale. Nevertheless, demolition is an unattractive option: tearing down a neighborhood landmark and center of community has a similar negative impact on civic pride. Too often, these irreplaceable landmarks are removed and replaced with characterless box stores, indistinctive housing units, or vacant lots, permanently erasing a piece of a neighborhood’s character. The best case scenario for deconsecrated historic churches, from preservation and sustainability standpoints, is the reuse of the existing structure. Sometimes, a new congregation may take over the vacated space, but where new congregations are unable, unwilling or unavailable to move in, the best option is to reconsider the function of the church building, and adapt it to a new use. The conversion of warehouse and mill buildings to residential properties has been especially popular in the United States, revitalizing neighborhoods and cities left struggling since the departure of industries. Adaptive reuse is especially well suited to vacant churches. These buildings are often of high architectural quality, community importance, and occupy accessible, central, locations. Reuse allows the community to sustainably preserve its landmark. Because the greenest building is the one that already exists, converting a church to a new use wastes far fewer resources than demolishing an existing structure and building something entirely new. Adaptive reuse also allows for preservation of the historic exterior of the churches, which are often architecturally significant and constructed with materials and methods no longer available. There are several different approaches to adaptively reusing a church building. Church spaces are well suited to community and civic uses, like performance centers, galleries, meeting spaces, or classrooms. Use of this variety generally allows the church to keep much, if not all, of its interior and exterior spaces intact. In this scenario, maintenance costs can still prove extremely problematic because community spaces don’t often manufacture the revenue needed to support the building. Some of the most exciting, sustainable and successful examples of adaptive reuse have been residential and commercial conversions. Large churches, especially in urban areas, can be ideal settings for multi-unit residences, or for mixed-use development, like office and restaurant spaces. While reconfiguring the interior space can pose a challenge for architects, these uses allow for the preservation of much of the historic exterior façades. Often located in desirable real estate markets, these churches are attractive to businesses, tenants, and developers, offering revenue-producing and permanent alternatives to demolition. Vacant churches located in historic districts are usually saved from the threat of immediate demolition by regulations, as in the case of Cleveland’s c.1890 Euclid Avenue Church of God, which is notable for stained glass windows that may have been designed by Louis Comfort Tiffany’s studio. The Cleveland Landmarks Commission has denied permission to demolish the building twice in the last two years, citing that the congregation cannot prove the building is beyond repair. However, these prohibitions are only a temporary solution. While the church has been spared from demolition, it remains vacant and deteriorating, and neighbors have voiced concerns about the structural stability of the towers. Even when protected by historic district regulations, vacant churches remain vulnerable to neglect and decay, and long term vacancy is a serious concern. By the time funds for repairs can be raised by the church or the community – if the sum can be raised at all – the property may have fallen into such extreme disrepair that is may be entirely impossible to preserve or rehabilitate the building. This situation, where demolition becomes the only financially-feasible option, can happen within the boundaries of a historic district or to an individually landmarked church. At that stage, there may be no remaining salvageable features, and the building, its historic fabric, memories, and place in the community are lost forever. 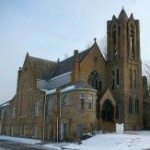 In Rochester, New York, the 140-year-old Westminster Presbyterian Church – the first Protestant church built west of the Erie Canal – has been vacant for two years, following years of declining use and lacking funds for repairs. Deferred maintenance led to significant decay: roof leaks, interior deterioration, missing windows, and crumbling masonry. While the building remains on the city’s list of Designated Buildings of Historic Value, it was removed from the state register of historic buildings, due to the “extensive loss of historic fabric and architectural integrity”. The property was recently sold to developer who plans to tear the building down and build a Dollar General on the site. Albany’s 163-year-old Trinity Church – designed by James Renwick, Jr., the architect responsible for St. Patrick’s Cathedral in Manhattan, and the Smithsonian Castle in Washington DC – was demolished earlier this year after years of neglect led to structural failure and a sudden collapse. The impressive building had been closed since the 1980s, and was recently sold for $500 at a city auction of foreclosed properties. 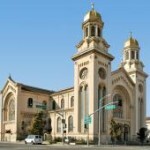 The loss is more tragic, considering the possibilities: even long-vacant structures can be saved and rehabilitated, as in the case of the National Register-listed St. Joseph’s Catholic Church in San Francisco’s South Market neighborhood, which stood vacant for twenty-five years following the 1989 Loma Prieta earthquake. No one in the community was able afford the cost of repairs and renovations – projected at $17-19 million – until a developer with plans to convert the space into offices and a restaurant purchased the property. Recent residential conversion projects provide further hope for the futures of these great structures. New York City’s Washington Square Methodist Church, a marble early Romanesque-style building constructed in 1860 by Charles Hadden, has a rich history in the West Village. Known as the ‘Peace Church’ in the 1960s for the aid it provided draft resistors, the church also served as a meeting place for the Black Panthers in the 1970s, and in the 1980s, it was home to the Harvey Milk School, a public school for gay and lesbian youth. In 2004, the remaining members opted to rent a new space rather than maintain the building, and the church was placed on the market. Prevented from tearing down the property by the regulations of the Landmarks Preservation Commission, the new ownership converted the space into residences. Minor exterior renovations were made, but even the majority of these – including rooftop mechanical equipment – are invisible from the street level, leaving the historic exterior visually intact. In Boston’s South End, two recently vacated churches are undergoing similar transformations. Concord Baptist Church, at the corner of West Brookline Street and Warren Avenue and designed by Isaac B. Samuels, has a history of adaptive reuse. The brick Victorian building with its distinctive octagonal dome roof was built in 1868 for the Church of the Disciples, who relocated in 1904. The congregation turned over again in 1946, when the Concord Baptist Church took over the space, where Martin Luther King Jr. attended while at BU. The Concord Baptist congregants had a different problem than most. By 2008, they’d outgrown their church and needed a larger, more centrally located space to hold their services. A developer purchased the property and proposed 20 residential units, with a series of new dormers and door openings on the historic exterior. Through a series of neighborhood and South End Landmark District Commission (SELDC) meetings, a plan for eight units was developed that maintained the church’s distinctive roof lantern, arched windows and entryways. New skylights will be installed to meet light and air requirements, and new doors will be added only at the rear façade, preserving the historic appearance of the building. The relatively minor exterior changes are offset by plans to undertake much needed maintenance: deteriorating windows and masonry will be restored to their original, historic conditions. The New Hope Baptist Church at 740 Tremont Street was constructed in 1862 by Hammat Billings. It is notable for its Gothic pointed-arch stained glass windows depicting the founding of the Woman’s Foreign Ministry Society, which occurred here in 1869. In the 1970s, the building was sold to New Hope Baptist Church, which preserved the windows. In 2010, the shrinking congregation voted to sell the property to a private developer, who proposed eight condominium units with a row of new dormers at the roofline. Meetings with the SELDC and South End Historic Society resulted in a plan that would transform the interior church space into four residential units and preserve all character-defining pointed arch windows. A portion of the roof will be replaced with glass – solving code issues for light and air, while leaving the profile of the historic roofline intact. These three churches, all located in local historic districts, are outstanding examples of developers, architects and preservationists working together to achieve a successful adaptive reuse project within the boundaries imposed by regulations regarding exterior changes. Success stories like these are promising, but the threat of demolition is still a grave concern, especially in areas with no civic protection. More can, and should, be done to protect these valuable historic resources. Great Britain has begun addressing the problem legislatively. In 1983, the Church of England passed a measure, enforced by Act of Parliament, setting forth procedures for reusing ‘redundant’ churches and emphasizing adaptive reuse. This method is certainly easier to enforce in the United Kingdom, due to their centralized church structure, but the actions have proved successful. One of the most charming, long-standing examples is St Peter’s Roman Catholic Church, which was the oldest Catholic Church in Liverpool until the time of its closing. After sitting vacant for several years, it was proposed as a site for rehabilitation, and has been operating as an award-winning Cuban bar and restaurant since 1995. Perhaps the simplest way to save these historic resources is by raising awareness about the availability, possibilities and potentials for these valuable spaces. Some congregations and communities have offered to sell churches for as little as $1 to anyone who promises to stabilize and rehabilitate the vacant buildings, which is a step towards making adaptive reuse goals more achievable. And there are several organizations and programs dedicated to preserving historic churches and advocating their reuse. Partners for Sacred Places, a national organization that assists communities and congregations identify new uses for their closed and underused churches, advises on the care and stewardship of the historic buildings. The New York Landmarks Conservancy’s Sacred Sites Program offers four separate grants to assist in the preservation and restoration of historic churches and synagogues, awarding $7.3 million in its 25-year history. And groups like the National Trust for Historic Preservation, and the LA Conservancy have stepped in to assist specific interested parties with purchasing and converting vacant church buildings. Certainly, there are challenges to adaptively reusing vacant churches, including potential controversy over reclaiming a sacred space for a secular purpose, renovation and maintenance costs, regulatory obstacles, and finding buyers willing to negotiate these challenges. But, as people are seeing all over the country, adaptive reuse is worth pursuing as the most sustainable way to preserve the special character of these church buildings and the communities they can continue to serve.